On this tour, we will explore one of my favorite Guatemalan specialties - coffee. I will pick you up at your accommodation and we will venture out into the countryside to a coffee plantation. The farmer will guide us around the facilities and explain us the different steps of coffee production. We will also enjoy a delicious lunch specially prepared for our group. Our next stop, will be a visit to a very popular gourmet coffee shop in the capital and taste 5 different coffee varieties. By the end of the experience, you will be an expert on Guatemalan coffee! Discover the journey of Guatemala’s most famous product - coffee - all the way from the plantation to the cafe. Your tour will begin with transportation to a Guatemalan coffee plantation, where the local farmer will show you around the facility and explain the process of coffee production. Your group will then enjoy a very special lunch on the plantation. Though this farm does not have its own restaurant, a meal will be prepared with classic Guatemalan dishes for your group to enjoy in a relaxing rustic environment. After lunch, you will head back to the capital city to investigate where the coffee ends up. Your guide will lead you to one of the best specialty coffee shops in the city, offering a wide selection of gourmet blends. 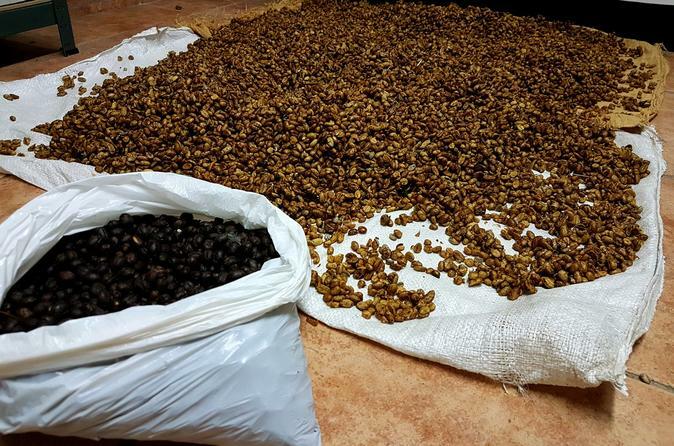 You will indulge in a tasting of 5 different types of coffee to experience the “end result.” This tour is for adventurous travelers who want to learn all about one of the most important specialties of Guatemala. The experience is sure to perk you up! Pick up and drop off at the accommodation. Join me on this journey to learn all about Guatemalan coffee. We will see the origin of this representative product by visiting a local coffee plantation to learn all about the production process. After enjoying a nice lunch at the farm we will return to the capital city to indulge in a tasting of 5 coffee varieties at a specialty coffee shop.